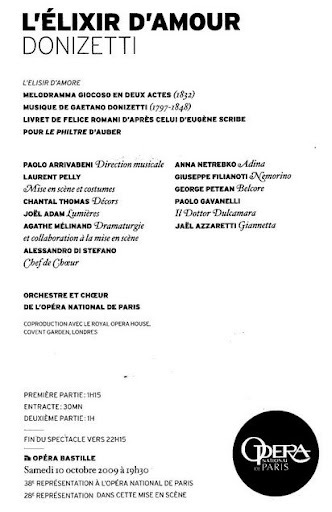 ...This was the 38th performace of this opera at Opera de Paris, the 28th performance of the same production and it’s a coproduction with Royal Opera House in London. Many famous artists go to sing at Opera Bastille (some pictures from inside and outside - HERE) and not at Garnier. The acoustics in Bastille is not very good in the upper part. I have no idea how it is in orchestra stalls as the tickets are too expensive there. Maybe it’s better. But normally the best acoustics in an opera house is at the balcony/gallery/amphitheatre, depending on the venue. Well, not here. It’s a double NO. No good sound and no good view (this opera house is very high so the second balcony is up and pretty far away from the stage). The sound stays on the stage. Also the sound from the orchestra. You don’t feel it like filling the venue. You hear very well, but it stays down there. Difficult to explain. My seat was at the second balcony, almost central. Good view. I noticed that not all the voices could be heard with the same intensity even if it was obvious that the artists did their best to be heard. Also there was a problem when they turned their faces towards the back of the stage or if the orchestra went a bit louder. For sure there wasn’t a problem hearing Adina, Belcore and Dulcamara. But for Nemorino, the attention was doubled all the time. ......The sets are nice. They present the Italian countryside from 50s and 60s. a filed in the background, packs of hay, a real tractor, a real truck, bicycles, scooter (very funny moments with Anna on this thing), a tavern, central square of a little town and even a dog that crossed the stage twice, running. Beautiful costumes too. In the program there were some pictures from an Italian movie, "Riso Amaro" (1949), a movie with Vittorio Gassman and Silvana Mangano. ......The first act opens with Adina laying on a pile of hey ballots, reading, while Nemorino is up on the last ballot looking and her and singing “Quanto è bella, quarto è cara!". I didn’t understand why they needed some many packs of hay on stage. There was a huge pyramid as you’ll see in the pictures. The protagonists (Adina, Nemorino and Belcore) as well as the members of the chorus had to climb up and get down many times, while singing. I talked to George Petean (Belcore) after the performance. I was curious how it was from their point of view this particular set. He said it was exhausting climbing and singing in very unusual positions (the first time he sings he leans on a pack of hay and one leg up on another pack. Weird. He also said that he has no idea what people in the hall heard as he was constantly turning the head. We heard everything. He has a great voice. The lighting was … oscillatory. The whole scene takes places in short time, on daylight. At first there’s strong light on stage and even a stronger light coming from above on Adina, to emphasize the situation. It’s hot, she’s lazy and so on. But when they start singing and the chorus is entering the stage, there are a lot of shadows. At some point the spotlight on Adina is so strong that she get a tan. Then it’s strong light again, and again shadow. ......The second scene in the first act belongs to Dulcamara. All hey is removed and instead there’s a truck coming. A real one. That was a very good idea. The whole scene is funny. Dulcamara’s voice is enjoyable except the moments when, at the end of the phrases, almost all the time he felt the need of raising too much his voice. Many times it was not needed as his voice is strong enough to be heard very well. ......The second act takes place in a supposed town square. People gather here to celebrate Adina’s wedding to Belcore. After a while Nemorino brings a tractor on stage. Then again there are two piles of hay on stage, this being the last change. The protagonists are singing in different strange positions. Belcore sings with one foot up, Nemorino stays on top of a ladder and on several chairs, Adina goes up and down on the packs. ......Anna Netrebko is great both vocally and as an actress. She can be very funny and this is the perfect opera to show her abilities. Even if it’s very difficult to understand what she’s saying, you forget about everything when she sings. The duet with Dulcamara when the voices have to be synchronized and very fast was amazing. Not a second of delay. Also her aria in the end led to so many applauses that we all thought she’ll raise and start sing it again. There are not too many opportunities to applaud Anna so the public took this chance to do it. ......George Petean (Belcore) and Paolo Gavanelli (Dulcamara) have good voices. Is the first time I listen to them live and if they managed to get their voices heard in the venue, than they’re good. ......They have to cover a long and wide stage, which involves a lot of running. Especially from the part of Nemorino. He has to be the funniest on stage. Giuseppe Filianoti is a great actor only that running, screaming and making funny faces does not replace singing. Not any kind of singing, but correct one, as Anna is perfect. Filianoti got tired towards the end of the first act. And I think the interval was not long enough for him to get back his breath. It was better, but in the middle of the second act he dances so much and runs from left to right for so many times that the tiredness was obvious. He should have considered that most of the people there want to listen to the famous “Una furtiva lacrima”. I heard an approximate rendition of this aria. Too much breathing and movement, not enough emotion and a trembling voice from time to time, on high notes. When sung properly the audience requests an encore in most of the cases. It’s up to the tenor if he wants to do it again. And some of them did it: Rolando Villazon in Salzburg and Juan Diego Florez this year in Vienna. Even if last night there were a lot of applauses and even a “bravo” that was not the time for an encore. Again, this is just me, but I have something against singing from the throat. This might be the easy way to get high notes, but not the best. I talked some time ago about “the singing head” (as I couldn’t find another name for this). This is how I felt Filianoti’s voice after he got really tired. Too bad. I think that he knows now that running + singing = unsecure voice. The next performances will be better for sure. ......After the performance Anna came very quickly but either she was in a hurry or she was too tired to spend too much time with the people. She gave autographs, had some pictures taken, but it was obvious she wanted to leave as she was slowly moving towards the door. ......I met some great people at the backstage. Even if it’s the first time we meet, it wasn’t difficult to recognize each other. It is always interesting to exchange opinions after a show. When you do it over dinner is even better. Thanks Anna! Great evening. See you in Vienna! Very nice report and impressive collection of photos!!! So nice to see them to remind us the performance. Unbelievable - fantastic photos and a great report. Thank you Irina! So glad that you enjoyed the performance. Your photos are amazing. It makes you really feel the excitment. privat de mare parte din frumusetea muzicii lui Donizetti. Eu am vazut pe DVD o inregistrare de la Viena cu Anna Netrebko si Rolando Villazon si am fost incantat. Rolando a bisat "Una furtiva lagrima" - minunat. Sper sa reapara curand pe scena. @Margarit - nu suporta comparatie cu Rolando.Nu l-am mai ascultat pe Filianoti si din aceasta cauza voi da vina pe alergatura de pe scena. Una furtiva lagrima este o arie dificila din cel putin doua motive. Sunt multe pasaje unde tenorul este singu-singurel, fara sprijinul orchestrei si este la finalul operei. Cam ca Cessa.. in Barbier. Finalul trebuie sa fie reusit si pentru asta trebuie sa aiba resurse. Dar cred ca si-a dat seama dupa prima reprezentatie ce trebuie sa faca. @Hariclea - YEEEES, Rolando. And Roberto too... after all, why not. The age can be overcome by the voice and acting part. "There are not too many opportunities to applaud Anna so the public took this chance to do it." Well, I think Anna is a very responsible artist, she very rarely cancels a performance (well, because of pregnancy, but that´s absolutely comprehensible, isn´t it?). I made the experience that she is not so much in giving autographs, maybe because of her baby at home, for which she takes care by herself. I can´t find words of how much I admire her, such a great artistic work AND travelling with her baby-child AND having a long-distance relationship with the man she loves. That´s almost to much pressure for a single person, but she manages to cope with it. I can only say that Anna is great on stage, but flickery in private. And she is not into giving autographs and posing for photos. This fact is not related in any way to her baby. Filianoti sang as he does it almost always. He has a nice voice, but sings badly and this will cost him eventually. His singing has notjing to do with running on stage - I saw him earlier this year in Lucia in Vienna [also with Anna and George] and although the stage direction was much "calmer" he still sounded bad most of the time. But he renders a lot of passion and people fell for it. 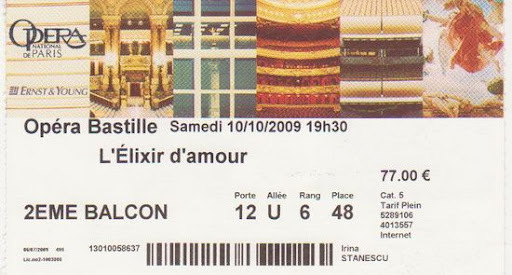 Were I able to go to Paris this fall for hte Elisir, I would have loved to see it also with the alternate cast that included the splendid Tatiana Lisnic [who's also Romanian!!!] and the seductive Charles Castronovo.